Mantova’s physical location is interesting. Sitting on the Mincio, a tributary of the Po river, it was since pre-Gonzaga days surrounded by water. This was accomplished by creating four artificial lakes around the city, for defensive purposes. Since that time one of the lakes has been eliminated, but the other three are still there, with the result that Mantova occupies a little peninsula, much like San Francisco. The most famous self-proclaimed Mantovano is of course Virgilio, the greatest of Roman poets, author of the Aeneid, and a contemporary of Caesar, Augustus, and that whole bunch. 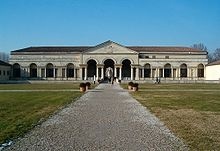 Mantova is very proud of her illustrious son, and often honors him with exhibits, conferences, and the like. In the Aeneid Virgil gives an interesting mythical account of the founding of Mantua, which we will leave for another post.